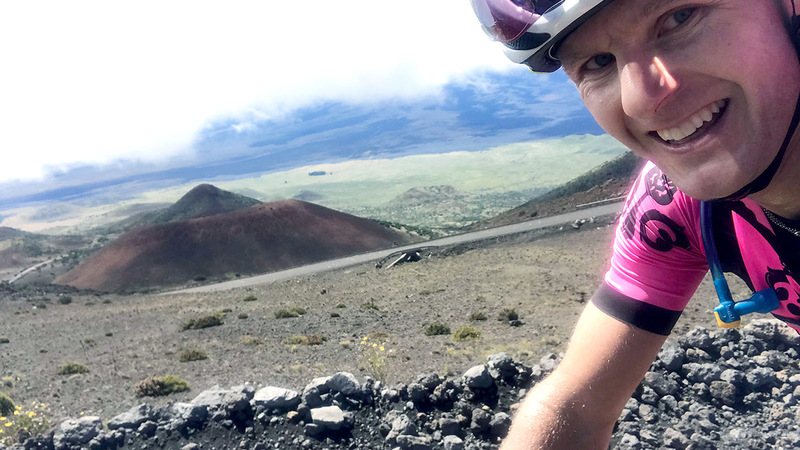 I’ve always loved to climb big mountains on my bike, and when my wife Briana qualified for the Ironman World Championships in Kona, Hawaii in 2016, I learned that one can ride up to the top of Mauna Kea (the 13,800 foot volcano around which the island of Hawaii is formed). I started to research the climb, and I found a website rating it among hardest in the world. I also read some personal accounts; everyone mentioned the extreme grades and elevation, as well as the dirt section where most swap their road bikes for mountain bikes. 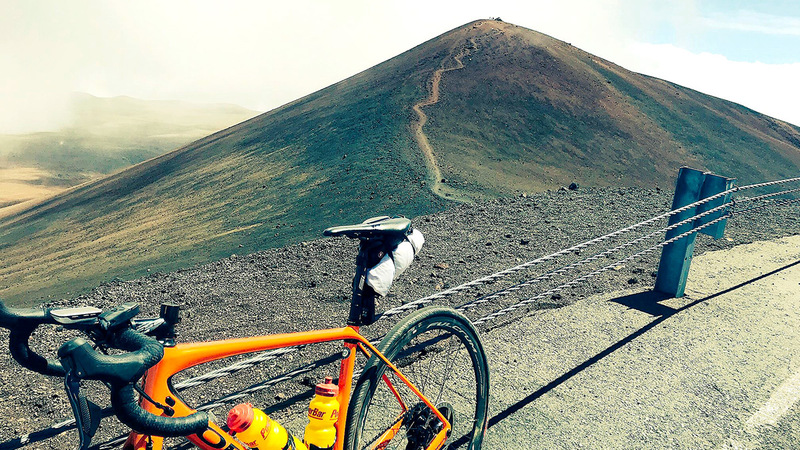 There are many ways to measure how hard a climb might be, but all of them still result in Mauna Kea being the most difficult climb in the world. One popular method is the FIETS index, created by a Dutch Cycling magazine of the same name. The challenge was too enticing to resist! I decided to give the monster climb a try while Briana was enjoying her taper, and set off at dawn from sea level with a friend. Long story short, some mechanicals and poor planning led us to cut our attempt short at about 9,200 feet. I had another opportunity in 2017 when Briana qualified again for IMWC, but Mauna Kea wasn’t in the cards for me that year, as I was preparing for IRONMAN Arizona. 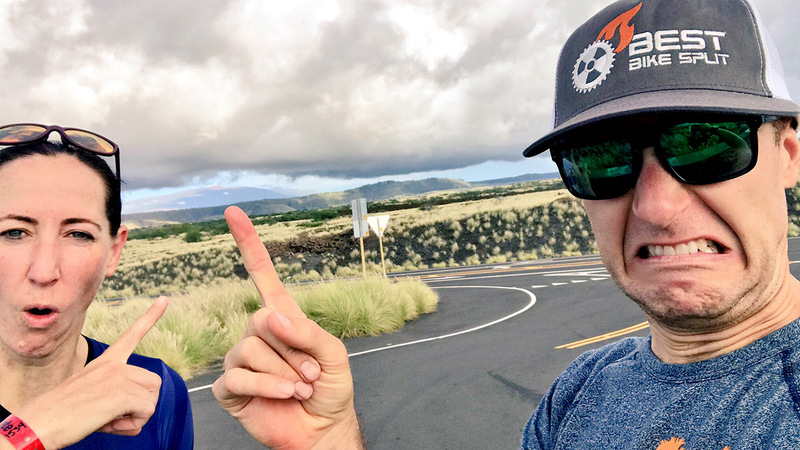 2018 rolled around, and when Briana secured her third consecutive Kona qualifying spot, I decided to make Mauna Kea my focus for the last half of the season. 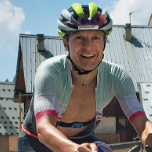 I had spent the summer logging some big climbing days, including the Alpe d’Huez Triathlon, and I knew my cycling was strong. 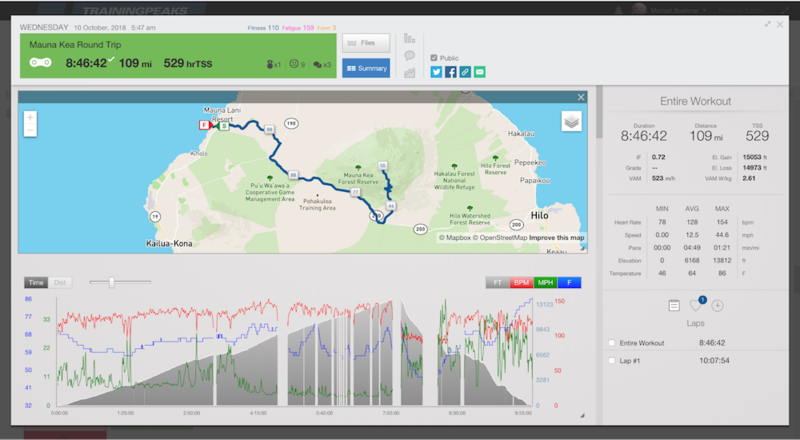 As we got closer to Kona, I started riding a bit more than usual, including some short commutes to the office. I also maintained the longer climbs I had been doing before AdH. In my final weeks of preparation I tested myself a bit on the bike, and ended up logging my best 20-min power in nearly five years! After landing in Kona and promptly getting a flat on a training ride with Briana, I swung by the local shop for some fully puncture-resistant 30mm tires, the fattest I had ever put on a road bike. They even had a little “texture” which I hoped would help with the dirt section of the climb. I threw those on, and did a quick check of everything else before packing up for the long day ahead. My alarm went off at 4 am, and got on my bike about 15 min before civil daylight began. Just like my 2016 attempt, I had two bottles of energy drink, a 70oz hydration pack with water, and a plastic bag with all my winter gear strapped to my pack. It would turn out to be one of the more epic things I’ve ever done on a bike. While the initial parts of the ride have some steady rolling hills, you don’t really get to the business until you turn left from Saddle Road onto a small two-lane road with a couple signs indicating the Mauna Kea summit. This lower section of pavement up to the Visitor’s Center starts just below 7k feet, which means you have more than 7k of climbing to go in less than 15 miles. This is where the climb starts to get quite tough. The average grade of 7.9% for 6 miles doesn’t sound too bad, but there are a number of sections where the gradient tips up over 20%. I had to bear down and push as hard as I could simply to keep moving, and at four hours into my ride this felt a bit desperate. Despite my attempts to recover when I could, my heart rate was hovering in the lower ranges of Zone 4. I didn’t even shift when the road flattened out—I needed to get my HR to drop so I could continue to eat and drink. I took a long break at the Visitor’s Center to learn about the road conditions, eat and talk to the people driving to the top. After the Visitor’s Center, you’re treated to five miles of volcanic dirt, at grades well into the 10% range. This was easily the most challenging piece of cycling I have ever done. It started well, with only one small hiccup when I spun out, but the last mile was torture. My tires were good, but they were no match for the washboards, which were four inches deep in some places. On more than one occasion I needed to push my bike up a short steep section where I was unable to restart riding, and the last mile alone claimed 35 minutes of total ride time. When the dirt finally ends, there are only 3 miles of pavement left to get to the top. As I rolled onto the tarmac I stopped for one last snack—I know from riding in Colorado that it can be hard to pedal and eat above 11k feet for some reason…anyone else have that problem? As I was stopping my left adductor cramped. Luckily I was on a flatter section of road near a parking area, so I didn’t completely tip over into the road. I straddled my top tube, eating some extra-salty snacks and stretching. I contemplated the summit, and whether this was going to end my day. Luckily the muscle seemed to loosen up quickly, and I figured there was no time like the present. Plus, I was about to ride into the clouds, which is a really fun feeling. Much like the bottom section of pavement, there are quite a few steep sections of climbing in those last 3 miles, including one final grind of over half a mile at 13.5%. When I made the summit, I was well above the clouds, and they’d thickened so much that I couldn’t even see the ocean. It was still an incredible view. After snapping some pictures while eating some more food, I put on almost all of my extra clothes (arm warmers, leg warmers, vest, jacket, and hat) for the descent through the clouds. It was freezing—even though it wasn’t raining, I was accumulating water from the clouds. The top of the road is fast with very little air resistance due to the elevation and very good road surface. When I got to the dirt, I scanned the road, thinking maybe I could hop into someone’s car to avoid the washboards. Unfortunately no one was coming, so I figured I would give it a shot. I went very slowly (around 10 – 15mph) and was happy to stay upright the whole way. I also saw my first fellow cyclist coming the opposite direction up the hill—he was pushing his road bike too. When I got back to the Visitor’s Center, I had a warm coffee/cocoa mixture and some more food before heading back out. I was still shivering as I finally made it back to Saddle Road, turning right back toward Waikoloa. After that, it is a really long, gradual descent. In total I was riding downhill for 2hr 20min, and that alone might have been worth my three-year journey to the summit! 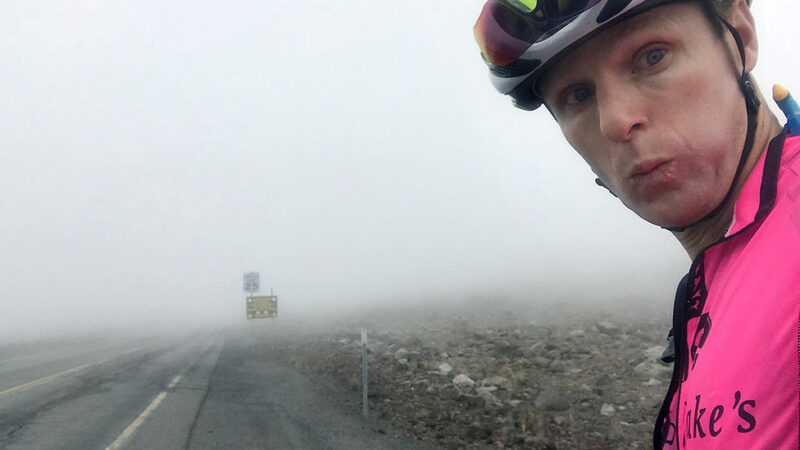 Michael Boehmer is the Product Manager and a Researcher on the R&D team at TrainingPeaks. He is a Wisconsinite at heart with a great fondness for cheese and ice cream, but he has tolerated the move to his wife Briana’s home state of Colorado. He has always loved the mountains and all the fun you can have in them whether on his bicycle, in his sneakers, or sliding about via skis. He’s been racing and coaching in the world of triathlon since 1998 with a few amateur national and world titles. You can always spot him with a sideways swim cap or waving at the camera and having fun on the course.